Welcome to the USF community! We have listed your Next Steps here so that you will have a smooth transition to USF and complete important deadlines required of all new students. Your myUSF account will give you access to the USF network, your USF email account, and many other services. You'll need an account to make your enrollment deposit, register for classes, and more. Go to myusf.usfca.edu and click "Log in" in the upper right hand corner. Enter the username provided in your admission letter in the Username box. 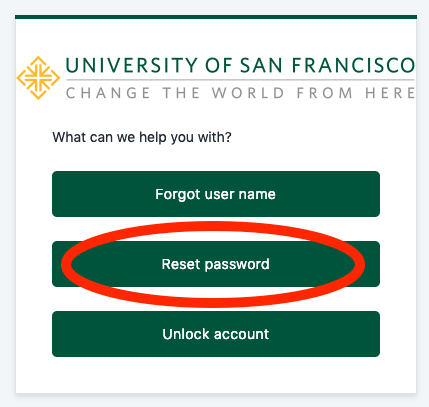 Leave the password box blank (note: your USF ID number is NOT your password). Click on "Sign In Help"
You will be asked to retype your username. 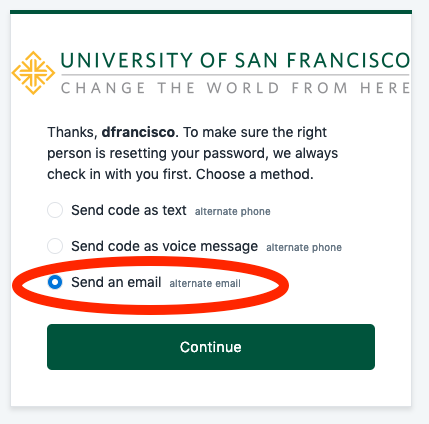 Then, choose "Send an email", which will send a temporary code to the email address you used when applying to USF. After entering the temporary code, you'll be guided through the steps to create a new password. To confirm your enrollment and reserve your spot at USF, you must make a non-refundable enrollment deposit of $250. Log into myUSF. 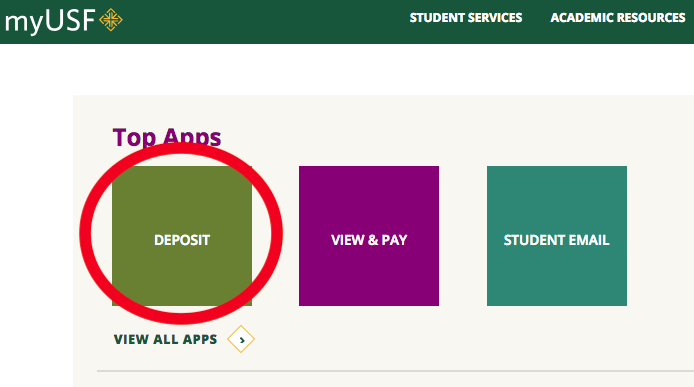 Click on the "Deposit" button on the home screen and follow the instructions through the checkout process. Deadline: You must submit your enrollment deposit within one week of receipt of your admission letter. A quick reminder: In order to verify and accept your financial aid offer from USF, you'll need a myUSF account (Step 1). You should have also already sent us the FAFSA. Once we have these items, the Financial Aid office will send you both a paper award letter and email. Beginning March 21, you may log in to myUSF to review and accept the award. Go to myusf.usfca.edu and click on the Banner Self Service (Student) button. Click on the Financial Aid tab, then "Financial Aid Information", then "Awards." Select the correct year to see your award amount. Click here for a step-by-step guide to accept your financial aid award. Your aid cannot be credited towards your account unless you accept it. Important: In order to accept your financial aid award, you may be required to submit additional documents. Please visit the Financial Aid Guide for newly admitted students for more information on how to view and accept your financial aid award. Deadline: We recommend that you accept as soon as possible after access to myUSF so that any aid will be credited to your tuition and other charges when payment is due. Veterans: Please contact our Veterans team at veterans@usfca.edu to ensure that they have everything they need to process your benefits (e.g. Post-9/11 (Chapter 33) benefit, Yellow Ribbon Scholarship, etc.). Although undocumented students are not eligible to receive federal aid, there are a variety of scholarships, grants, and loans for which you may be eligible, including Cal Grants or University Grants through the California DREAM Act. USF also uses the College Board CSS profile to determine if further aid is needed. We are committed to empowering undocumented students to bolster their future as college graduates. For more information, please see USF's Task Force to Support Undocumented Students. If you a non-citizen, you may be eligible for certain types of financial aid. To see if you qualify, please visit the Federal Student Aid website. All BSM students are required to provide transcripts for any college work not previously received. If your USF Applicant Status page shows that you're missing any transcripts, please have the institution send them to us directly. To see how your college credit might transfer to USF, please visit our AP/IB/College credit page. We also recommend that you check your degree evaluation, which will show how your AP/IB/College credit may have transferred to USF credit. To view your degree evaluation, log into the myUSF dashboard, click on the Banner Self Service (Student) box, then Student Records → Degree Evaluation. Missing transfer credit on your degree evaluation? Please contact your Enrollment Counselor. Webtrack Advising is our online class registration process for first-time students. Webtrack will provide you with valuable information on USF's academic policies and procedures, graduation requirements and major requirements. It will also guide you through the online class registration process and explain which classes to register for. Go to myusf.usfca.edu/webtrack/management/bsm to watch the introductory advising video tutorial. Tutorials will be available beginning Wednesday, May 29. Deadline: Webtrack opens on Wednesday, May 29. You should complete the tutorial and quiz as soon as possible before class registration opens on Monday, June 3. New students can begin registering for classes on Monday, June 3, once they have watched the advising tutorial and completed the quiz. New students can begin registering on Monday, June 3. Log into myUSF to begin. For detailed instructions on how to register, refer back to the Webtrack tutorial. Here are the exact course numbers that you need to register for. Your USF degree evaluation will show how credits from your previous institution may have transferred to USF. To view your degree evaluation, log into myUSF dashboard, click on the Banner Self Service (Student) box, then Student Records → Degree Evaluation. The Office of BSM Admission will be in touch with more detailed information regarding the mandatory New Student Orientation for Bachelor of Science in Management students to take place in August 2019. Students at the Pleasanton and Downtown San Francisco Campuses will also participate in a campus introductory meeting during the first week of classes. The Office of BSM Admission will provide details. For general information about this year's undergraduate costs, visit the Tuition and Fees page. In June, you'll receive an email notification to view a preliminary (not official) bill. It will include expected charges for tuition and health insurance. To calculate your anticipated balance, subtract your financial aid award for fall from the balance due. We provide this bill in June so that you have an idea of what to expect on the official bill you'll receive in July. In early July, after you have registered for classes, you will receive an email that your official billing statement for fall is available online. Access your bill by logging in to myUSF and clicking on the View & Pay box. From there, you can make a payment or view current account activity from the "Your Account" window. You can view your statements from the "Your Bills" window. You will not receive a paper bill. for the fall semester is due August 1. If you register for classes after August 1, you must be prepared to pay the balance due at the time of registration, or you must enroll in the semester payment plan. If you do not see your financial aid applied to your bill, you might have outstanding requirements before the financial aid can be applied. Check your financial aid status by going to myusf.usfca.edu → Banner Self Service (Student) → Financial Aid, or contact the Financial Aid Office (Step 3). You may pay your tuition using online e-check, personal checks, international bank wire transfer, or by signing up for the semester payment plan. For more information, please visit the payment methods page. Authorized payers are parents, spouses, employers, etc., who can view bills and make payments online. To set up an authorized payer, go to View & Pay, then click the Add New link located in the Parents and Authorized Payers window. For instructions to make a payment as an Authorized Payer, please visit the Authorized Payer page. Deadline: Students must make payment in full or enroll in a semester payment plan by August 1. Failure to meet the payment deadline may result in cancellation of your course registration. Subsequent deadlines are January 1 (spring semester and intersession) and May 1 (summer). All USF students are issued a university photo ID card called a USF One Card. A USF One Card is an important part of campus life. You will need your One Card to access USF buildings and facilities, add funds to your meal plan and Don Dollars debit account, borrow books from the library, and more. Please upload a photo to your One Card account by August 2 so you can receive your One Card on time. Please visit the One Card 2019 Fall Orientation page for instructions. Students born on or after January 1, 1957, must submit evidence of two doses of MMR (Measles, Mumps, Rubella) immunization. If proof of immunization for MMR is not available, a blood titer showing immunity for the disease will be accepted. The Health Promotion Services has partnered with Med+Proctor for the collection of all immunization records. Students can visit the immunization page for further directions on how to submit their immunizations. All students are strongly encouraged to keep a copy of their immunization records for future reference. Failure to submit proof of immunizations by the appropriate deadline will result in a $100 fine, and may also result in a registration hold on your student account. Deadline: August 15 by 5 p.m.
As we strive together to create a socially responsible learning community, USF requires that all students complete Think About It before arriving on campus. Think About It is a research-based, online training program that empowers incoming students to make healthy choices and to minimize risks associated with alcohol, drugs, and sexual violence. You should receive an email from Campus Clarity when the course becomes available. If you have not received the email, please contact us at think@usfca.edu. Students who fail to complete the course by the deadline will be charged a $100 late fine. Thank you for helping us create a safe campus environment for all. As a condition of enrollment, the University of San Francisco requires students to have a health insurance plan, both to protect against unexpected high medical costs and to provide access to quality care. All undergraduate students registered for nine credit hours or more will be automatically enrolled in and charged for the USF-sponsored Student Health Insurance Plan. Students who have a health insurance plan with coverage comparable (equal or better) to the USF-sponsored plan can waive the student health insurance plan online by visiting the Health Insurance Policy page. The waiver period begins June 6 and ends September 1. Deadline: September 1 by 5 p.m. If you do not waive the insurance requirement by September 1, you will be automatically enrolled in and charged for the USF-sponsored plan.